The Koh Phi Phi Long Tail Boat taxi is one of the island's most enduring sights. Most of the Phi Phi Don and all of Phi Phi Ley is mountain or cliff, there are no roads, and so the best form of travel is by sea. This is especially so for the travellers, workers and any cargo. The Koh Phi Phi longtail boat taxi is not unique to the island and is in fact common throughout southern Thailand. 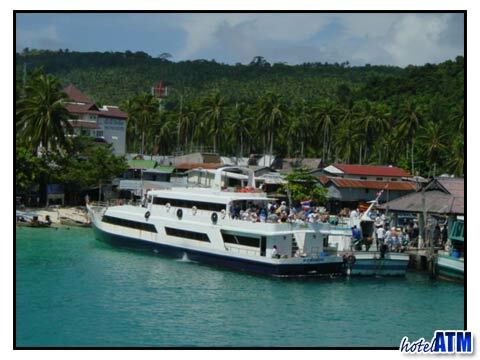 Local boats ferry people to and from all around Phi Phi Island and they are the life blood of the transport network. The longtail boat taxi is a coming together of shallow river and creek boat with a tractor engine mounted on it's rear. The engine drives the prop and the most striking aspect of the boat is the way it is steered. The engine is on a pivot and the driver has to pick the propeller out of the water and place it back in the direction where he wants to go. Moving a 500kg engine requires a finely tuned pivot and a lot of strength especially when the wind and waves get up. Alongside local longtail boat taxis men others come from Phang Nga Bay, Krabi Province, and Koh Lanta to work hard. Some of these men from outside Phi Phi and have no family on the island, come as a group and build precarious bamboo huts to live in right on or over the sea's edge in between Ao Ling and Tonsai Towers. You can see this settlements if you look to the left as you arrive at the pier. One of the key longtail boat taxi routes is the main pier to Long Beach and back. Either side of the pier you will see banks of longtail boats moored bow to the beach and stern to sea, bobbing and swaying with the incoming wave or surge. The boat men are either sitting on the boats or standing in groups at the land end of the pier and this is where you can organize your ride. Phi Phi longtail boat men are organized and have a price structure for tourists and some show these rates on a promotion board that they carry around, so that you can read them. On the whole they speak little English and rarely any other language. If you are visiting Long Beach to do a bit of snorkeling and take in the views you will need to pay 100 THB per person one way (June 2012) and the trip is yours. The longtail boat taxi has a whole different price structure after dark. It will be more and often 150THB per person one way, but it does vary. There is also another more expensive price break after midnight. Given that many tourist have been having a drink at the beach bars like Slinky Beach Bar it is not surprising that ferrymen are a bit defensive. In negotiating after dark, take it slow, be patient and everything is fine. Getting into the longtail boat taxi is a bit of an art. The steps that are lowered over the side for each getting on and off, are rarely more than 3 rungs and the longtail boat taxi is made to rock quite strongly. As you place your foot on the first rung the boat will rock towards you. There seems to be no graceful way of boarding the longtail boat but once on try to sit in a place to balance the boat (side to side). As you come in the boat you are probably carrying your shoes which are covered in sand. It is best to wash them in the sea as the driver does, as this is seen as polite. Finally on a need to know basis, the front or bow of the boat is the 'head' of the boat. As with many head and feet protocols in Thailand, don't put your feet up pointing at the front. The longtail boat has brightly coloured ribbons adorning the bow. These are good luck charms and will be in a place of respect for your ferryman.